AppChest - Store your licenses smart and secure. AppChest is a smart new elegant way of storing your application licenses. 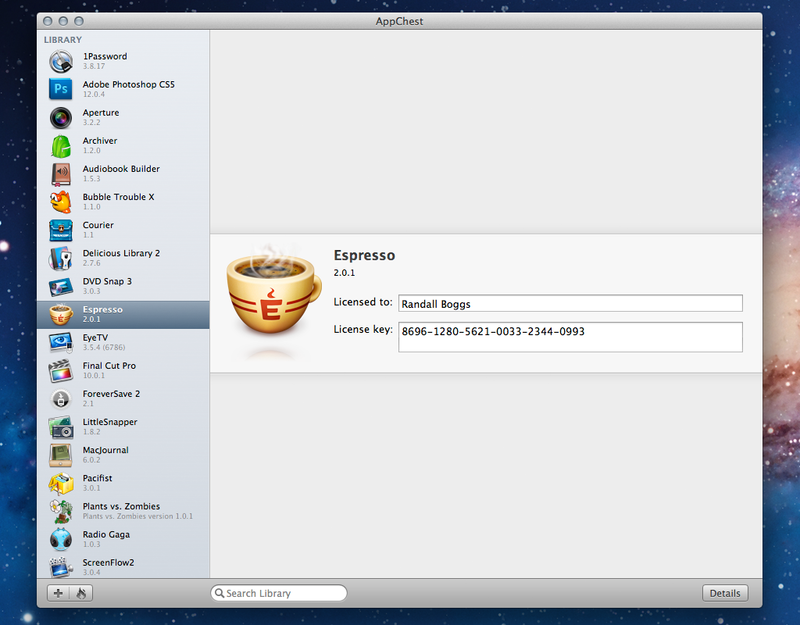 Just drag your purchased apps to AppChest's library and enter their license keys. No matter if it's an email, pdf or text file containing the license, all attachments are automatically searched for useful information and autofilled if possible. Your privacy and protection of the license keys is very important for us. That's why AppChest is encrypting both the license data and the attachments with the latest encryption algorithm, AES-256. Let's say you've just downloaded an application and you're giving it a try. You're not sure whether you're going to buy it or not. Even though you haven't purchased it yet, you can add it to AppChest as a desired application which is then displayed in grayscale in your library. Once it's purchased, it turns into a normal application again with a valid license. Flagging applications this way is the most elegant way to keep apps you're considering to buy in mind. AppChest makes sharing of application licenses between co-workers, friends or family really easy. If you are sharing licenses with some other AppChest users, all applications are exported in a special file format for a quick future import. For all other purposes, use the plain text file format which can be opened by all word processors. Before sharing any licenses with someone else, you should always make sure you're allowed to do so.